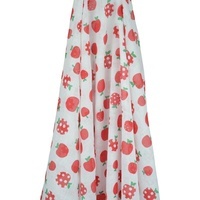 This fabulous and fun muslin wrap is ideal for all babies, whether its for swaddling, shading, or privacy when feeding. Our unique fine weave super soft 100% cotton muslin wrap is comfortable and delicate, our extra large size 140 x 120 cm is perfect for swaddling. Coordinate back with our pram clips to complete the look.